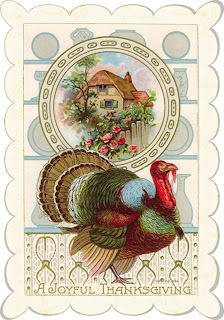 Have a wonderful and safe Thanksgiving weekend! I'm sure looking forward to the rolls and pies I made today. What's your favorite Thanksgiving dish? I grew up in the Western United States and since living on the East Coast, I've noticed some major differences. Well, of course there's the humidity, the usually fair Autumn weather, the southern accents and the confederate fanatics. But there's also a bit of a difference in Holiday decoration. 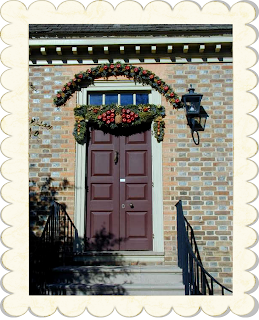 Last Thanksgiving weekend, I visited Colonial Williamsburg and was so enamored with the Christmas decorations on every single window and door. 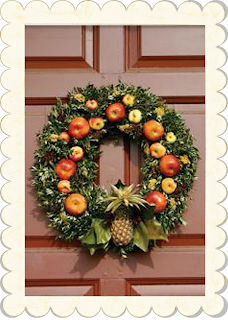 Fresh apples, citrus fruits, greenery and ribbons made up the most beautiful wreaths and hangings. 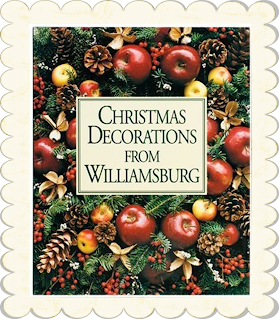 I was so inspired that I purchased a book over the summer, "Christmas Decorations from Williamsburg". It's chock full of gorgeous photos, instructions for probably a hundred decorative items, and recipes. It's so much fun to look through! 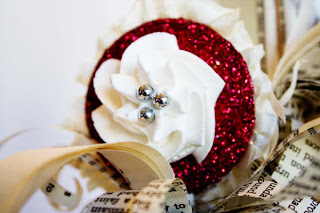 Since I'm just getting in the Christmas mood, I wanted to share some of these fun holiday decorations with you. Maybe I think they're so attractive because they remind me of the simpler times when Christmas wasn't a commercial holiday. This style isn't unique to Williamsburg, but has spread throughout the state as well. 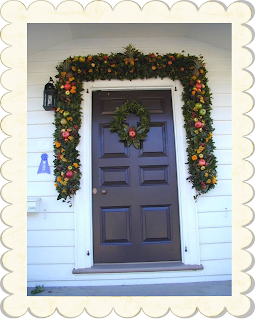 I just got back from a day of making Boxwood wreaths for a nearby Country Club. It was such a fun time! And last night I was with a women's group and we put together centerpieces for our holiday tables with fresh greens. My dear adopted mother here is an expert florist! 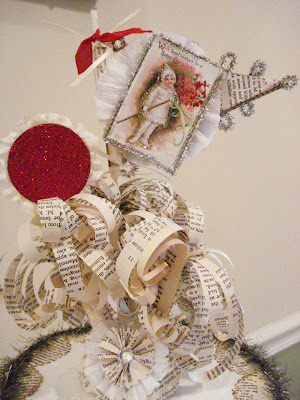 What holiday decorations inspire you as you create? Has there ever been a boutique that you found on the internet that you want to visit so badly that it hurts? I found one of those! 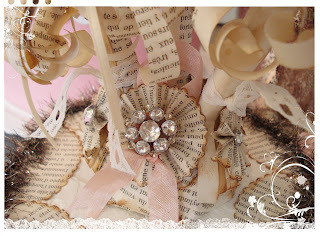 Through my little blogging world, I came up on the Mari Robeson Style blog and just fell in love! Then I realized that this is the same Mari that has been featured in many, many magazines including my favorite, Romantic Homes. 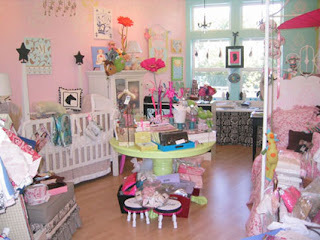 She and her boutique were featured in the "Shop Keeper's" section in May of this year. I had seen a gorgeous photo of her boutique and wished I didn't live on the opposite side of the country as her Arroyo Grande, California store location. If you are lucky enough to live near the village of Arroyo Grande, please stop by for a visit and tell Mari that Jenni B sent you! Happy 253rd Birthday, Ms. Antoinette! 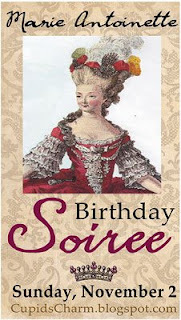 I am honored to be joining many, many of my friends from Cupid's Charm for this fabulous Marie Antoinette Birthday Soiree. 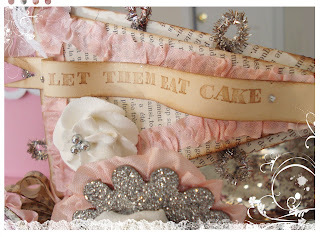 Let me share with you the "Let Them Eat Cake" cake, designed especially for this event! 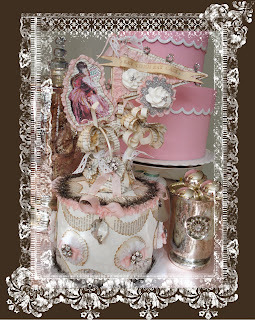 I traveled all the way to France to gather relics to adorn this cake ode to Mademoiselle Marie on her special day. These chandelier crystals were taken from the famed Hall of Mirrors in Versailles, Queen Marie Antoinette's home outside of Paris. 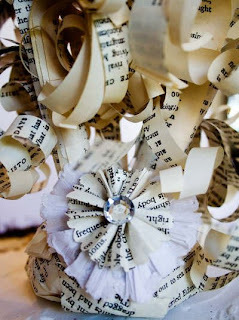 Pages of vintage French text were hand cut and attached to the sides. These pages could, perhaps, be actual words of Marie but since I cannot read French they very well may be about bugs and insects. 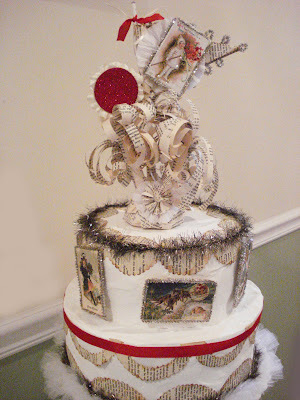 And yards of ribbon from Marie Antoinette's favorite ball gown were removed and carefully recrafted to grace her 253rd Birthday Cake. If you have read through the end of this paragraph, you'll know that this description has definitely been fictionalized! 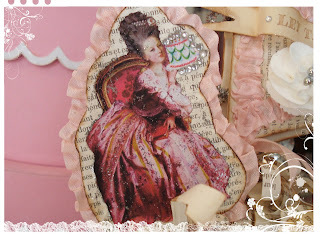 Thank you for joining me for the Marie Antoinette Birthday Soiree. If you are interested in a custom cake similar to Marie's just contact me! 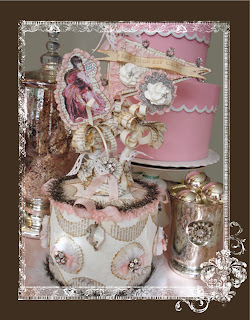 And please, please visit Joy at her award-winning blog, Cupid's Charm for a list of other participants in this birthday party to see creativity from Marie Antoinette fans from all over the world! 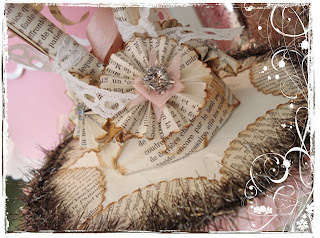 I am so excited to be part of this Marie Antoinette Birthday Soiree, hosted by Joy at Cupid's Charm! Ever since I heard about it I started thinking up something yummy and creative to make. 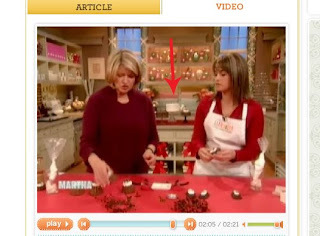 See, since Marie's birthday is on November 2, a bunch of us bloggers are going to post photos and descriptions of our Marie Antoinette-themed confections. On that day (this coming Sunday! 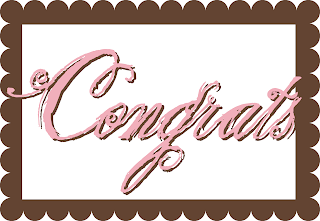 ), visit Joy's blog to see who has posted their creations to their blogs. While I'm not a big fan of Marie Antoinette herself, I just love her unique style and fashion that she brought to France when she was married to the King. That fashion has been so inspirational the past few weeks on many of my creations and I am so excited to share my newest Jenni B Original with you! I look forward to seeing what all of my friends have created as well! New Items Added to My Shop! I've been so busy working away in my little studio and am so excited to present to you my latest creations! 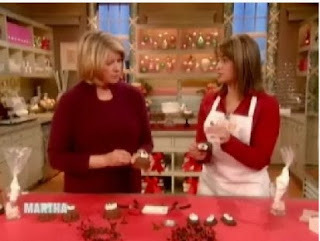 It's no secret that cupcakes are at the top of my list when it comes to likes. So it should be no surprise that my new Holiday line had to include them. And here they are.Topped with lots and lots of glass glitter, these sisters sure do shimmer! 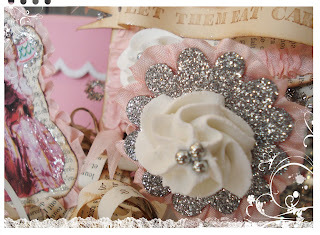 And not only have cupcakes been a-baking, but new glittery garlands have been in the making! A few posts ago I showed pictures of my new power tools and now you finally get to see what I was using them to create. 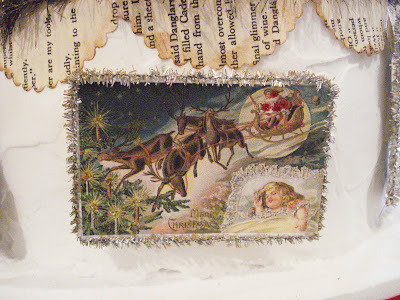 Each of these vintage postcard images was mounted to a thin piece of wood with vintage book pages on the back. 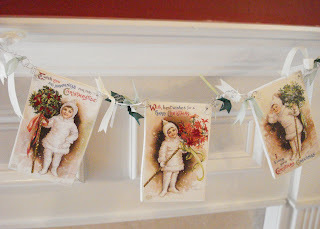 These garlands and cards are so much fun to make and have been giving me a little break (which was much needed) from faux desserts. I'm thinking it might be extra, extra fun to give one as a GIVEAWAY in an upcoming post, so stay tuned! 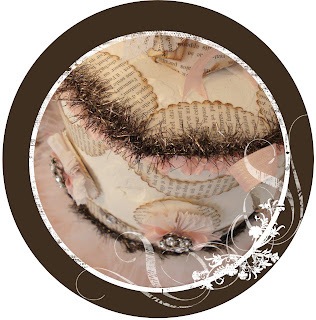 Since I have been using so much of that wonderful seam binding and have really fallen in love wiht it, I've decided to offer it in my shop for sale so all of you can get in on this great ribbon if you don't own some of it yourself already. Guaranteed you'll flip when you start working with it. This week I have some baby gifts to give away and I can't wait to use it in my wrapping! Visit my store for a selection (let me know if you'd like a color not listed). 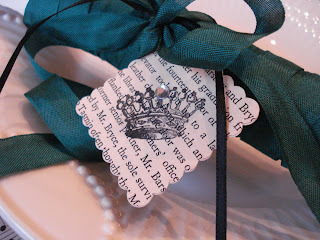 It's a great purchase at $2.00 for 5 yards and a crown tag is included with each length. I finally have something really good to blog about! 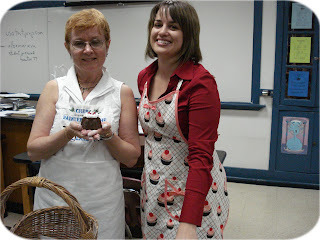 This past week marks the finish of my very first actual teaching course of Jenni B Originals Faux Desserts. 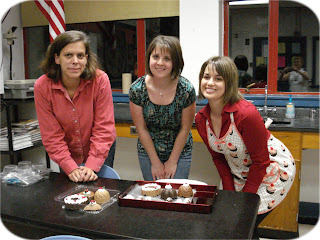 The course was a community education class here in Charlottesville and these ladies and I had SO much fun together! 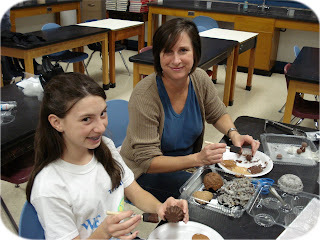 The class was two weeks and take a look at the projects they took home! This was a cute mother and daughter. That little one was so creative! 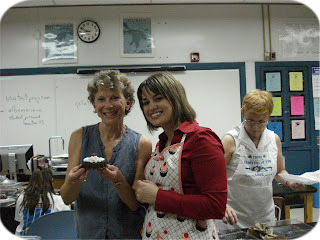 I had a great time teaching this class but I think it was because my students were gems. They were all so excited and eager to learn and had creative minds. I can't wait to do it all again! It was high time that I got a makeover for my blog. I was so tired of the same boring old brownie. It's only been up for a year. 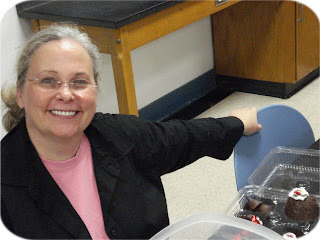 Now it's time for cupcakes! So I have a question for all of you readers out there: how often do you get a blog makeover? And do you change your logo for your business? Do tell! Also, I have some more photos of the Every Holiday Cake that I've been so excited about. 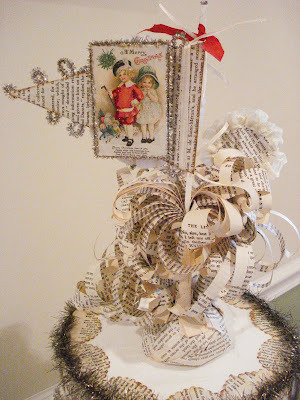 This is the base of the cake topper. 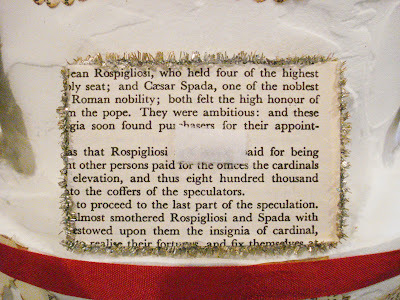 And here is the added "icing" to one of the picks for the top of the cake. 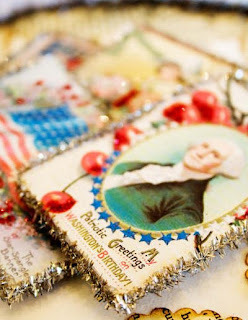 These are a few of the cake images for the Fourth of July. 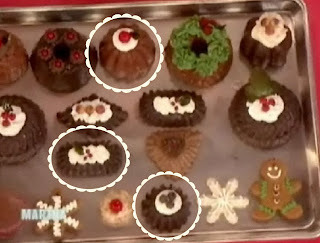 Remember, these cakes come with ten images of each of the following holidays: Christmas, Valentine's, Easter, Fourth of July, Halloween, Thanksgiving & Easter. ...The newest Jenni B Original creation! 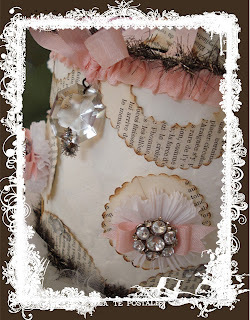 Take a look at this fun altered art faux cake! I think I had more fun creating this cake than any faux dessert I have ever made. And I've made a lot of desserts! I know you think this cake looks neat, but wait until you hear about this surprise: all of the images and the colored ribbons are interchangeable and it's a cake for all Holidays! 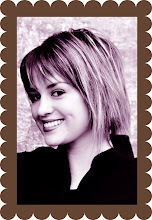 Mini postcard images can be switched out for Halloween, Thanksgiving, Christmas, Valentine's Day, Easter, and the Fourth of July. There are even birthday pictures so you can change the pictures when someone special has a birthday coming up. The parts of the cake are so DETAILED. I think that's why I had a lot of fun creating it. Each removable image has a nice back side with a little velcro that keeps it in place. All of the images have tiny tinsel around the edge. 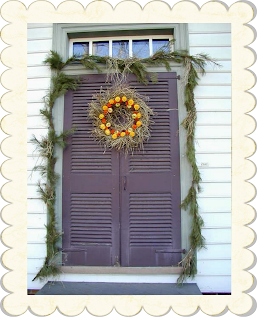 And I even included 2 extra images for each holiday so you can pick your favorites! See that pennant on the top of the cake? The images (one is in the back) are even reversible there and you can put any one you want in those spots! You can't really tell in the pictures very well, but each little photo card (the cake comes with 70!) has glitter accents in two colors. And get this - the entire top of the cake is removable so you can take it off for storage (but you'll NEVER want to put this thing away!). The cake isn't totally finished yet, either. On the bottom layer of the cake, I have yet to attach the faux icing top knots with silver dragees (fake, of course) to some of the scallops. I was just too excited to wait any longer before posting about this beauty. 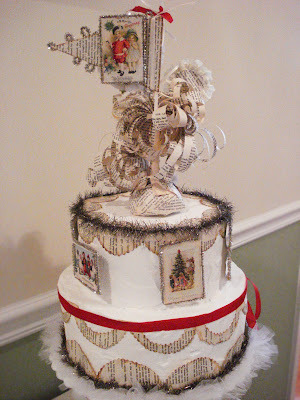 The cake itself measures 8" in height, and then with the topper it ends up being about 14" tall. 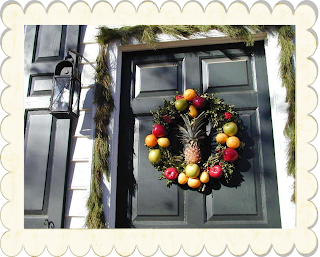 I just think it would be the cutest decoration for your front entry. 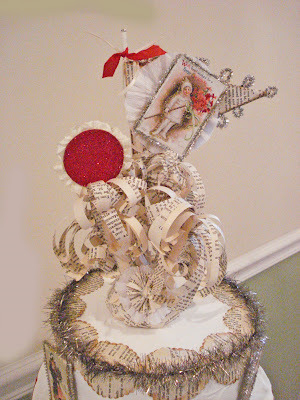 And it will be so much fun decorating it with all of the ribbons and picture cards included for every Holiday.